Braun Series 9 Review: Is It Worth It? 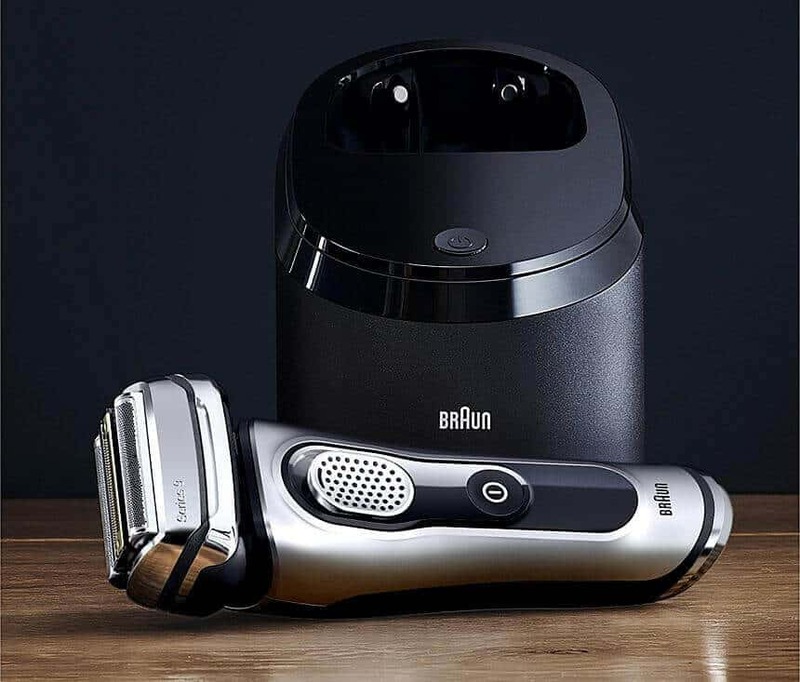 As a bald man who also likes shaving that beard stubble from time to time, there’s a lot I can say about in this Braun series 9 review. Dubbing it ‘The pinnacle of Braun shavers’ will be fitting. An ‘Electric shaver Behemoth, ways ahead of its competition’ might work fine too. But that’s a bit cheesy, don’t you think? Too much marketing speak and you’re definitely not here to hear that. Let’s focus on the important things instead. Why is the Series 9 from Amazon.com that good? Questions demand answers – and I’m here to give them to you in this Braun series 9 review. Note: I’m talking about the 9290cc Silver variety from Amazon.com of the Series 9. Generally, the difference only lies in the outer shell of the shavers or whether you’re ordering a set with a cleaning station. Where does it actually stand? Before going more in-depth with its features and shaving quality in our Braun Series 9 review, let’s first do something else. 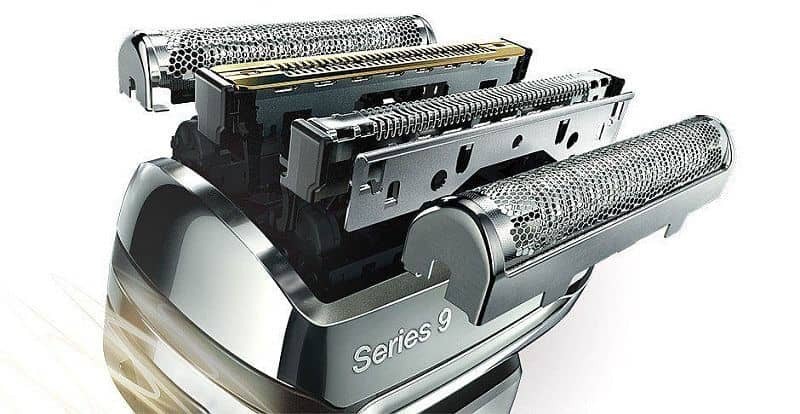 Let’s see where the Series 9 stands in the shaver market, considering its pretty much premium price. In terms of Braun products, Series 9 is the logical successor of the Series 3 to Series 7 Braun shavers. Design-wise, it steers away from the Series 7 appearance and goes back to how Series 5 looks. If we’re talking about competition between brands…Well, things get interesting. Electric shavers are dominated mainly by three brands: Philips Norelco, Braun, and Panasonic. All of them offer a very diverse product line. Series 9’s direct competitors are the Norelco 9700 from Amazon.com and Panasonic’s ES-LV95-S Arc5 from Amazon.com electric razor. The biggest win in this Braun series 9 review over all these other shavers are the shaving directions. At 10 directions, it remains untouchable (Norelco 9700 has 8, for example.) And shaving directions still remain one of the best measures for comfortable shaves. 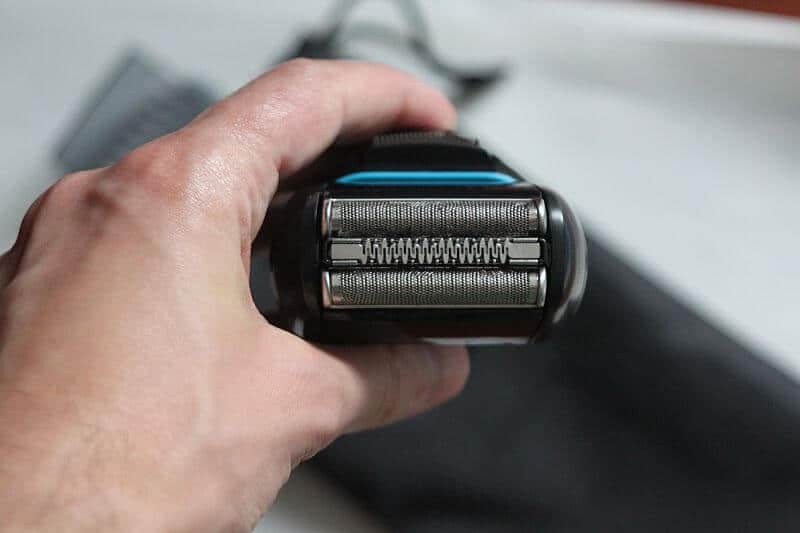 Considering that Braun has been dedicated to making electric razors for so long it is no surprise that they lead the industry. Philips and Panasonic are no slouches either, but they are usually trying to play catch up with Braun when it comes to innovation. This is a basic summary before I move on to the real review. If you’re more interested in Braun shaver comparisons, check my Series 7 vs Series 9 article. Torn between picking a rotary Norelco or a foil Braun? I also have an extensive comparison between both brands‘ electric shavers. With the ‘Where Series 9 actually stands’ question answered, let’s move on to the real review. Generally said, there are three factors for getting a very good shave with an electric razor. Some models score high on two of them, but fail the last. Others do an ‘alright’ overall job, a well-rounded grooming tool. 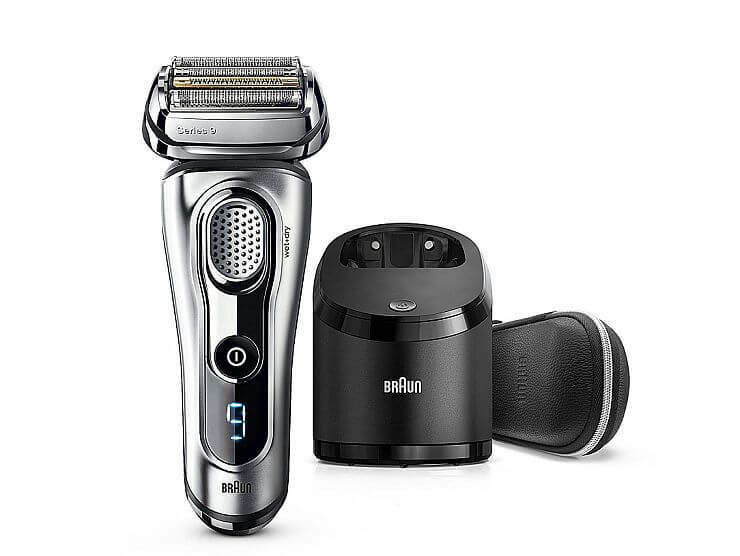 Braun Series 9 goes above and beyond on all three of them, as expected of the brand’s most premium shaving solution. The first thing I’m talking about are the shaving directions. As I said, you have 10 of them here. 8 of them are the so called “MacroMotion” movements targeting your face’s larger contours. 2 of them are “MicroMotion”, aimed at conforming to the more delicate, smaller contours of your skin. It’s not rocket science: the more shaving directions, the smoother, more precise shave. Other Braun shavers or even high-end Norelcos max out at 8 directions. Clearly, Series 9 has the better edge here. Another important element that you will note in this Braun series 9 review are the cutting actions per minute. Directions don’t mean much if the motor is too slow: it’ll just jam at thicker hairs. At 40 000 cutting actions, Series 9 majorly outperforms previous Braun shavers that clock at around 30 000. As foil shavers are generally more powerful than rotaries, it also retains more power than Philips rotaries. The only serious competition I see it having are the latest Arc5 shaver variants. Panasonic have done a good job at installing roaring motors in their newer foil shavers. Last but not least, there’s the whole design and structure of the shaving head itself. And this deserves a new subheading! I mentioned this in the Series 7 vs 9 comparison, but it doesn’t hurt to mention it again. This is Braun’s legacy ‘4 Shaving Elements’ system. It’s pretty good, with two OptiFoils taking care of smooth, close shaves in line with your face’s contours. Usually, this is where foil razors come up short against the rotary ones. Getting into the tight areas of the face and following the contours was never easy. Braun innovated the design and implemented a sort of cushion under the blades. Acting sort of like a shock absorber, this allows the blades to move around while you are shaving. As the blades move, they can hug all the edges and contours for a close shave on any part of the face. Series 9 introduces one completely new shaving element for a total of five. That’s the Direct & Cut trimmer: a detail designed to cut hair growing in different directions. Usually that’s a headache and a good recipe for bumps or ingrown hairs. An additional detail is the extra strong titanium coating in Braun’s ActiveLift trimmer. Rebranded to HyperLift & Cut in the Series 9, its golden looks deliver even better results. Summed up in short, it lifts all those flat hairs that otherwise would be difficult to shave with ease and accuracy. Similar to the keys to precise shaving, there’s exactly three convenience factors you most likely will care about. In terms of battery life, the Series 9 offers nothing new. It sticks to the standard 50 minutes of running, if you let it charge fully. The latter takes about an hour. In a way, though, it’s an improvement: considering Braun upped the motor power, yet retained the overall running time. As far as wet/dry shaving goes, the Series 9 shaver supports both. This is a definite step above some of the older Series 7 models as you could do only dry shaves with them. I’ve found that foils are generally better with even thicker shaving gels/foams. However, personally I vastly prefer dry shaves. Just make sure your skin is clean before that to reduce irritation/inflammation. There are some preshave oils and creams specifically for those that don’t want to exactly dry shave but aren’t looking to have to battle with foam or gels to shave. It’s the best of both worlds as you only need a very thin film just to keep the blades from irritating your skin. Last but not least: the cleaning station. As I’ve discussed, all brands’ cleaning stations provide you with a way to charge your shaver, and clean + lubricate the blades at the same time. The latter is important, as dull blades will cause irritation and make your grooming sessions take longer than needed. The Clean & Charge station has been upgraded with Series 9. It also dries the shaver after the cleaning and lubrication process has finished. This is a feature you won’t find in previous Braun shaver series. Drying is also pretty rare among other brands’ electric razors too. Honestly, this is the best way to go. You extend the life of the razor considerably by having an easy way to maintain it. You don’t need to worry about the blades staying sharp or that the hair is building up inside and behind the blades which would require lot of elbow grease to have to clean and lubricate it. As far as I know, only the high-end Norelco 9700 has a similar function. Note that Braun uses an alcohol-based cleaning solution across its Clean & Charge stations. Series 9 is no exception. The main difference between this and earlier cleaning stations is that its design is a little bit smaller. Well, obviously, this is an expensive model from Braun. It’s actually priced well above the high-end electric shaving solutions Norelco and Panasonic offer too. For more frugal people, I do recommend considering Braun Series 7 or even Series 5. There is not THAT big of a difference if you’re not a perfectionist, or have extra thick hair. Sure, the overall comfort is down a bit, but you’re still getting a close, gentle shave. Any Braun razor is going to get the job done, but I like using the latest models as they come out when I need a new one. Braun does a great job of improving on what is already working and listening to their customers when they design the new models. When the little details are thought of then you know you’re getting an exceptional performance. A thing you might find off-putting with Series 9 is the noise it generates. Foil shavers are usually louder than rotary razors. Given its power, the 9 exceeds that basic discrepancy in sound levels even more. This hasn’t been a concern to me with either shavers or clippers…But if you want to enjoy a silent, early morning session while your significant other/kids/whoever are still sleeping, it might be an issue. Otherwise, Series 9 still stands as Braun’s greatest creation to this day. I’d go as far as tell it’s the most comprehensive, thoughtfully designed electric shaver on the current market. The 10 shaving directions and specific shaver head design really make this one stand out. Is it easy to use? Are foils better than rotary shavers? 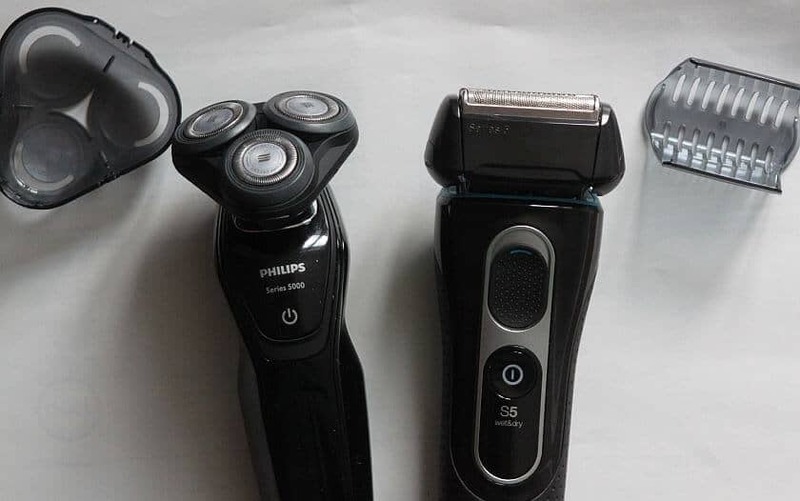 I’ve addressed the latter comparison in this Braun series 9 review with my article on using foil vs rotary shavers both for shaving your head, or getting rid of your facial hair. 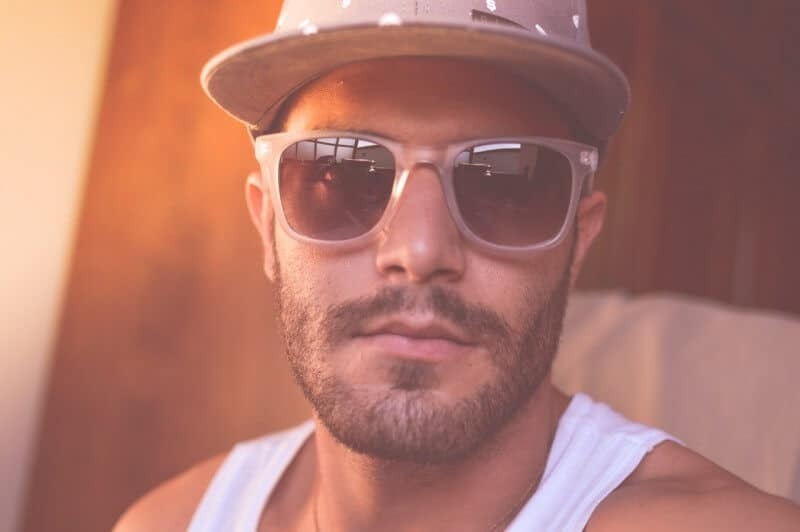 It should help you out if you’re wondering which style of grooming might work better for you. As for ease of use, Series 9 is child’s play. Just make sure you don’t press too hard when the blades come to contact with your skin. Braun’s guiding video is not that great, so let me direct you to Rich Harris’ one. I like it because he demonstrates the Series 9 both in terms of beard shaving and how efficient it is for bald shaves too. Here it is, hope you enjoy it! I was skeptical about buying this after reading lots of online reviews, but the $80 off and 20% coupon at Bed Bath and Beyond brought the price down enough for me to make the jump. I have very thick facial hair and have never found a electric razor that worked well. After charging this for the recommended hour, I gave it a whirl. I first had to shave my full beard down to stubble using my Wahl hair clippers, which left me stubble length of a two day growth. The Braun 9 series had no issue shaving it all down. It took me a bit longer to shave as it was my first time and was learning my shave angles that work with my growth pattern. No hairs were left behind. The razor foils left zero irritation or burn, and the razor gives a very close cut, I’d like to say even better than my Gillette mach3 razors. I’m looking forward to using this every couple of days if not daily. The weight and handle felt great during the whole shave, not once did I think it felt awkward or heavy. Keeping the foils clean and lubricated is a must as this thing is fast and I don’t want to wear things out without proper care and maintenance. The cleaning station Is a bonus, not sure how often I will use it over rinsing under hot water after every use and oiling once a week, but there are lots of DIY solutions for the cleaner that will help save $. Thanks for taking the time to give us such a detailed update on your experience. This will really help our readers out. I am a big fan of the whole line of Braun electric shavers.